Wargaming: an odd, old-fashioned hobby. Very analog but cool nonetheless. Surprisingly social for this frenetic, connected-yet-isolated, digital age. 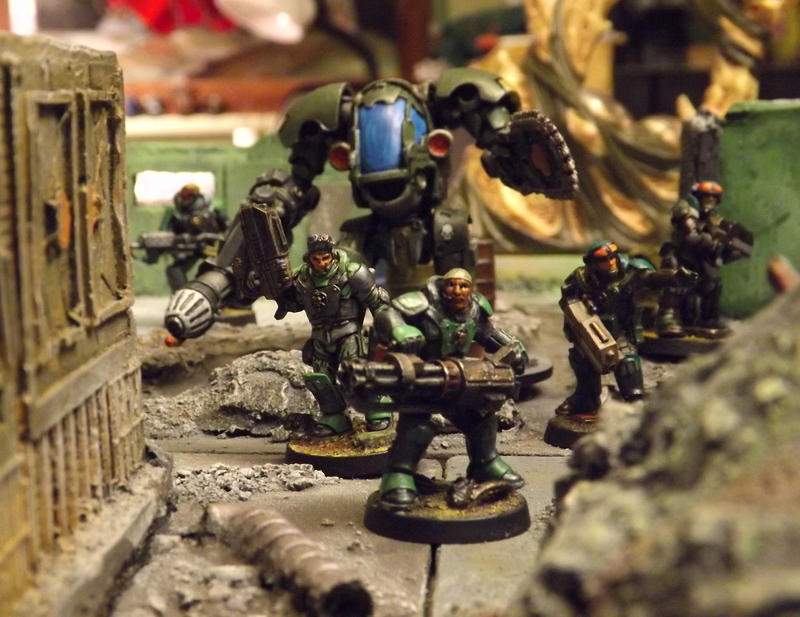 STALKER7 is a miniature war gaming site that features Battle Reports, Terrain, and Painted Miniatures, as well as original game rules and fiction. Partial to Science Fiction and Fantasy table top games, our weekly group, a.k.a. The Cape Cod Wargame Commission, also enjoys a wide variety of board games and RPGs like Blood Rage, Space Hulk, Advanced Song of Blades and Heroes, DnD 5e, Symbaroum, Savage Worlds Interface Zero 2.0, and Shadowrun. STALKER7 is also the current internet home for ZONA ALFA: Salvage and Survival in the Exclusion Zone, the upcoming post-apocalyptic war game rules from Osprey Publishing. In addition, you’ll find info on our upcoming, Co-op Cyberpunk Espionage rules HARDWIRED. Feel free to wander around, ask questions, and comment. If you would like the Cape Cod Wargame Commission to play test or do a review of game, or feature your company’s miniatures, terrain, or accessories, leave a comment below. Our schedule is full but we’d be happy to accommodate. For more information about my spec-fiction, please stop by my writing blog: Hot Space Station Justice. Which ruleset do you use for post-apo wargaming? We’re looking for something more “real” than Necromunda so any suggestions would be appresiated. Well done on the bloggy! Regarding rules – The guys I’m gaming with these days aren’t ‘gamers’ per se, so we’ve been using my simple ‘Cleared To Engage’ rules. TTG are a new idea for them and it’s challenge enough to get them to remember core mechanics, let alone genre-specific tweaks. I don’t think Necromunda’s core rules are bad. Why not strip away the fluff and introduce a STALKER-like setting? And speaking of excellent core mechanics, you should really look at Pulp Alley. Very versatile and robust. Flavor to taste and you’re good to go. Check out appropriate threads at Lead Adventure Forum for some excellent mods. Where do I get the rules for Zona Perestrelki? I looked all over, but didn’t manage to find the rule set. Wow, this looks really great! I had some players ask me to do a Stalker RPG, and I’d love to do a tabletop version some day. Will definitely be following your project closely. Thanks. The STALKER/METRO 20XX settings are too cool to pass up. There are a number of good PA-specific RPGs out there, (Mutant Year Zero recently caught my eye) but I’d love to hear more about yours at some point. The challenge for me writing the table top game is to bake in the aesthetic while respecting IP and accommodating the wide variety of miniature and terrain choices. ZONA ALFA isn’t a sales tool for a specific company or range of figs. I mean any excuse to buy new figs, right? But the goal is for players to be able to slot in whatever suitable miniatures they already have and get stuck in. I’ll definitely check it out your book when it releases. I’ll keep posting STALKER stuff on my blog as I do it, but the core of the system is a simplified Dark Heresy D100 ruleset. I’ve added some flavour from the FATE system to give players a strength and a weakness. No skills or talents, everyone is reasonably adept at basic tasks. Your success comes more from your equipment, background and reputation. I did this to reduce book keeping and let the atmosphere take over. I’m all for reduced book keeping. You’re playing my song there. I want ZONA ALFA to be an AK47 of skirmish wargames: functional, reliable, straightforward. First off, thank you for the kind words. I really appreciate them. A lot of people visit S7 but most don’t comment and it’s nice to get feedback. I’ve enjoyed wargaming and miniatures for over 40 years. Although there’s a fair amount of content and upkeep, this is all fun, not real work. About ZONA ALFA, I believe Osprey has it slated for early next year. They are incredibly busy, cranking out books, figs and rules, and ZA is just one small sliver of a large hobby pie, so to speak. We’re ahead of schedule tho, so there’s always a chance for earlier release. HARDWIRED is going to be updated and expanded later this year. Can’t talk much as it’s the early stages, but all that you mention will happen. And a bit more. Restructuring S7 to have dedicated areas for ZA and HW is under consideration as well. That’s a whole other project, so most likely late this year. Thanks you again. Have an excellent day. Dear Patrick T. (a.k.a. STALKER7). Here I am again with some more questions. I would like to ask you if you have a Facebook group (or something similar like a profile) for your games (specifically thinking HARDWIRED)? And if you have not, do you think about making one so all of us can share our stories, missions, warbands etc.? Thank you in advance and again, please, keep up the amazing things that you do!